The report details an evaluation of the Nurturing Attachments Group provided across four geographical areas developed by Kim Golding. Twenty-nine of these adoptive families consented to participate in a quantitative study led by Professor Julie Selwyn, University of Bristol. Additionally, 8 of these parents were randomly selected to participate in a qualitative analysis of their experience, analysed by Dr Olivia Hewitt, University of Oxford. These evaluations suggest that the group intervention met its aims of increasing support, understanding and confidence for the parents. Parents reported different perceptions of their children’s behaviour alongside improved abilities to regulate and to reflect on the internal worlds of their children. They felt that this led to improved attunement with their children. Whilst the challenge of parenting the children remained high, the parents did report changes in their perceptions of the children; leading to a perception of improved relationships with them. Parents were hopeful that they would be able to continue to develop their use of the parenting skills learnt and that over time this would increase security for the child. 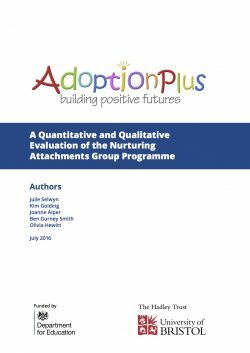 Overall this study has demonstrated the efficacy of the Nurturing Attachments Group for increasing support to adoptive parents. These parents reported many benefits from their attendance and significant changes were demonstrated. A control or comparison group is needed to confirm that changes are a result of the intervention. Attendance at the group did help parents to meet the goals they had for participating in the intervention.